The UAA volleyball team opens the season this week with unfamiliar foes on one side of the net and some unfamiliar faces on the other. Eight freshmen — seven true freshmen and one redshirt freshman — dominate UAA's 15-player roster. One of them, outside hitter Eve Stephens, is a projected starter fresh out of Colony High, where she was a two-time Northern Lights Conference player of the year. Stephens is expected to start Thursday when the Seawolves begin play at the UAA Invitational, a five-team tournament at the Alaska Airlines Center. The tournament begins with a single match Thursday at 7 p.m. — UAA vs. Western New Mexico — and continues Friday and Saturday with four matches each day. 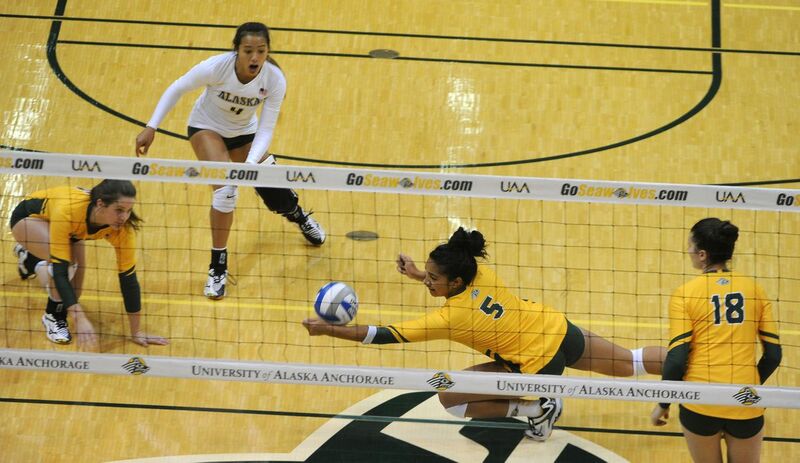 UAA plays the late match all three days. Although the field includes one known quantity — the Nanooks of UAF — the Seawolves won't face their rivals this week. Instead they will play Barton College for the first time in program history, Michigan Tech for the first time in 18 seasons and Western New Mexico for the first time since 2012. Gone from the UAA lineup are three starters from last season, including an all-time great in Leah Swiss who left the team after a junior season during which she earned All-America honorable mention honors. Swiss is focusing on academics, coach Chris Green said last spring. Also gone are defensive specialist Keala Kaio-Perez and outside hitter Anais Vargas, senior starters from last season. Plenty of veterans are back, including senior outside hitter Chrisalyn Johnson, a preseason all-conference pick in the Great Northwest Athletic Conference. Johnson and two other returners all garnered postseason honors in the GNAC. Johnson was an honorable mention selection, setter Casey Davenport was the Freshman of the Year and middle blocker Tara Melton was the co-Newcomer of the Year. Other starters back for the Seawolves are senior libero Taylor Noga and senior outside hitter Vanessa (Hayes) Boyer, who has a new name this year after getting married. The other projected started for this weekend is sophomore middle blocker Vera Pluharova, who played in 14 matches last season. UAA is coming off a 19-11 season and a fifth consecutive NCAA Tournament appearance. The Seawolves are ranked fourth in the preseason GNAC poll.